One hundred percent of those involved in athletics or a fitness regimen experience some level of shoulder discomfort over time. The pain can be acute and stabbing or dull and nagging, either way it can stop a person from doing what they want to do. Shoulders are also tough to figure out. The best part about the shoulder joint (huge range of motion) is also it’s greatest weakness (huge range of motion requires great stability). I’ve become a hip and spine guy over the last couple of years. It started with an influx of folks who were referred to me for strengthening just to alleviate the pain of everyday life. After years of study, practice and practical experience, I’ve got a pretty solid protocol that I use as a framework for clients suffering from back (usually disc) pain. And I can modify, even to the smallest joint angle, to increase the effectiveness of this protocol for an individual. To me, it’s become EASY compared to issues involving the shoulder. So, my next area of intense focus has been the shoulder. What I have found, through my own anecdotal experience with my clients and myself, is an 80/20 fix that seems to work wonders. 80 percent fix, 20 percent effort. 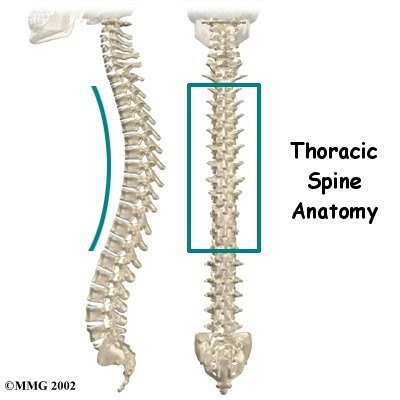 Here’s where the thoracic spine comes in. First, mobilizing this area of the spine. Encouraging extension, or flattening the curve, is the place to start. I use t-spine extensions over a foam roller for this purpose. Now that the t-spine has more movement capability, the key is to train the muscles that hold you in extension. Without this part, you’ll just be temporarily adding mobility instead of making it a sustainable fix. Make sure you pull with only the upper back. You SHOULD NOT feel this in the lower back. Thats it. Just these two exercises. Two sets each. Everyday. This is not an all encompassing shoulder fix, and it is oversimplified, but it does make a huge improvement MOST of the time. With a more neutral curve in your upper back, the shoulder will be able to move more efficiently. You’ll see less compensations in overhead movement, and your humpback-in-training posture will start to diminish. Give this relatively quick fix a try.